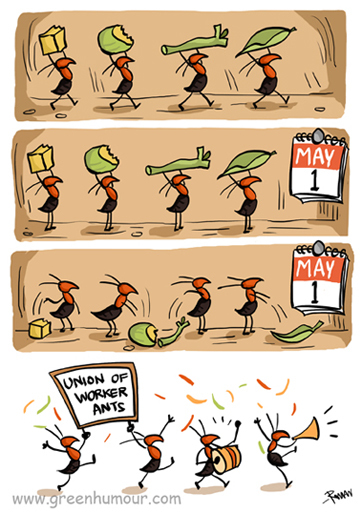 An ant colony typically consists of winged males called drones, one or more queens, and workers. While the job of the males is to simply mate and die, and that of the queen is to propagate; it is the workers that do the dirty jobs and keep the colony running- much like your boss sitting in his cabin playing Solitaire all day and you slogging on that stupid Powerpoint. Worker ants are all sterile females who perform the tasks we normally see ants do, like hunting, carrying food, building the nest and protecting it from predators, taking care of the young and even fighting invaders- a job for the larger workers equipped with stronger mandibles, referred to as the soldiers.